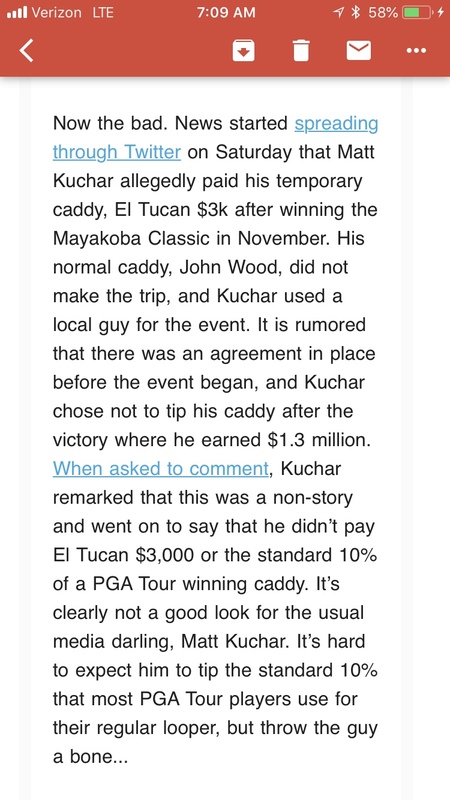 Kuchar - Mayakoba Caddie Drama - Your Take? Thread: Kuchar - Mayakoba Caddie Drama - Your Take? I’m sure most saw or heard about this, and I honestly think it was part of Kuch’s slow start yesterday. Word out there is he payed local caddie ‘El Tucan’ only 3k after his 1.3 million dollar win at the Mayakoba in 2018. Kuch says it’s a non story, social media is losing their ****, what say you about maybe the nicest guy on tour doing this? If true, my opinion of Kuch does change a little. A couple tour pros seemed to confirm it, and said that wasn’t out of character for Kuchar. It’s one of those where I don’t think we’ll ever hear the real story, but disappointing that there’s even a possibility of being true. Kuch has and always will be one of my faves on tour. Classy guy in my mind. Never out for himself. I’d imagine the local caddy agreed to the fee and either didn’t know about the 10% prior to doing so or didn’t care. I could see Kuch throwing him some more cash but if the guy agreed to it....then I don’t really see what the big deal is. After watching all the hubbub on twitter yesterday, am I alone in that I figure it’s his prerogative and don’t really care? If it was agreed on before they played then it is a non issue whether he did or didn't tip him. I was wondering before he teed off yesterday if it was going to affect him and it appeared to do so. I'm glad he shook it off and still won. It’s media types that want an intriguing story on a guy who’s basically the Angel of the tour and one fo the nicest guys and fan friendly guys out there. I got to meet Kuch once at Firestone in Akron. It was right before dusk on the practice day and I was heading out. Saw a few peeps over by the ropes. Immediately saw it was Kuch (really tall) I started to approach to say hi and maybe get a autograph. Then kinda steered away to head out. My nephew was with me. Kuch kinda yelled over the 5-6 people that were there already and said “hey bring that little guy over here....I’m still out here so you’re good!” We headed over and he basically took selfies with every person there (maybe 10 people and then gave autographs to all the kids on balls and some gloves. Then thanked US....yes us...for the support and sticking around so long on a practice day since he knew he was the last guy on the course. 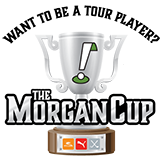 Last edited by PKorf; 01-14-2019 at 09:07 AM. I am with you, non factor as I am Sure there was an agreement. Maybe they choose not to speak of it before cause the guy lives in Mexico and it would be detrimental to the guy where he lives.....ever think of that? Last edited by donny475; 01-14-2019 at 04:09 PM. I will say this, it’s certainly a bit odd to see a bunch of white men suddenly so concerned about a Mexican and his paycheck. I have a real hard time passing judgment without the real facts out there. It's none of my business, so I'm in the "don't care" camp. If it was another player with less of a good guy personality, it may change my opinion. I get that there are agreements and a "standard" but in the end Kuchar can do whatever he wants, its his money and I could care less. I highly doubt he stiffed the guy completely and have no doubt the media is blowing it out of proportion.